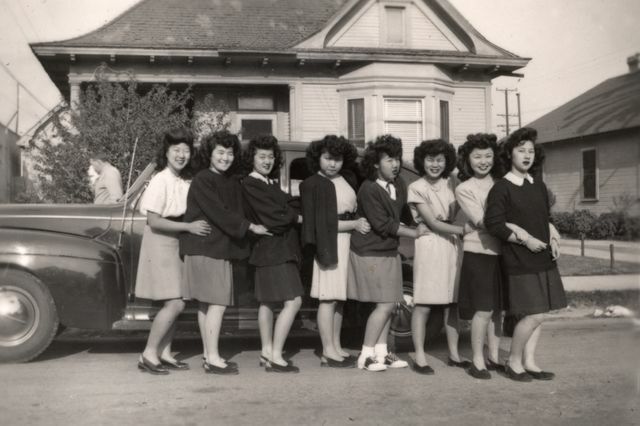 Just Us Girls, a club formed in Manzanar, poses in Boyle Heights circa 1946. Civil rights activist Aiko Herzig-Yoshinaga is known for discovering the critical evidence that led in the 1980s to belated Supreme Court victories for the 110,000 Japanese-Americans incarcerated in camps during World War II. But long before the Los Angeles native became a hero of the redress movement, she was a member of a group of Japanese-American girls who donned short-shorts, white anklets and tap shoes to perform at local movie theaters during reel changes. "Most people would be surprised to know that Aiko really wanted to be a dancer," said UCLA historian Valerie J. Matsumoto. The ambition might be surprising, but the means of pursuit was actually typical, Matsumoto writes in a new book. Before, during and after World War II, countless young Nisei — second-generation Japanese-Americans — pursued their interests, or just a good time, in ethnically based social and recreational clubs. In "City Girls: The Nisei Social World in Los Angeles: 1920–1950," published by Oxford University Press, Matsumoto shines a light on this vast network that was largely invisible to the city's mainstream. "So many of the ethnic youth clubs formed because the Nisei didn't always feel welcome in school, community and church groups," Matsumoto said. "But these girls wanted to participate in activities and have fun. The clubs were really important in helping them find a place of belonging." Thanks to the experience, club members embraced a range of American mainstream traditions, as well as important organizational and leadership skills that put them in good stead both after World War II and during the civil rights era, Matsumoto found. A member of the third generation of Japanese-Americans, Matsumoto is the older of two daughters born to Nisei, but her parents were from California farm families, a population that was the subject of her first book. Published in 1993, "Farming the Home Place: A Japanese American Community in California, 1919–1982" is widely regarded as a classic in Asian-American studies. While promoting the book in San Francisco, Matsumoto was struck by the stories elderly Japanese-Americans told of their urban youth. "The urban second generation enjoyed a very rich social world, and it was quite different from what my rural relatives had experienced," Matsumoto said. 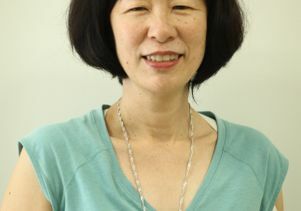 Matsumoto, who joined UCLA's faculty in 1987, started researching San Francisco's Nisei social life, but changed her focus after realizing that, as home to the largest population of people with Japanese ancestry outside of Tokyo, Southern California actually served as the epicenter of these activities. Matsumoto spent close to 20 years piecing this history together through interviews with surviving club members and pouring over microfiche of old Japanese-American newspapers, which tracked club activities. 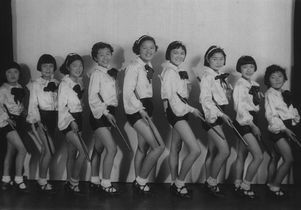 Future redress activist Aiko Herzig-Yoshinaga (third from left) belonged to a Nisei tap dancing club in 1930s Los Angeles. By the 1940s, Southern California boasted between 400 and 600 Japanese-American youth groups, the majority of them aimed at girls, Matsumoto found. In 1938, a newspaper reporter counted the number of group activities and found that there was just one day in the entire year —July 20 — when no Nisei group scheduled an event. Typically, between 12 and 15 Nisei events lured youth daily, including sporting events, dances, fundraisers, community-service activities and visits to museums, businesses and other local points of interest. Sometimes the clubs operated under the auspices of churches or such organizations as the YWCA or Girl Scouts. But often the girls forged the groups themselves or did so under the direction of an older Nisei. 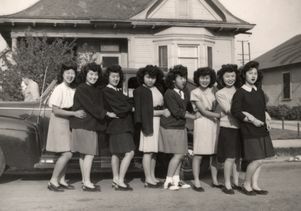 They called themselves the Les Jeune Filles (Venice), Swansonettes (Gardena), Queen Esthers (Hollywood) Sumire Kai (Santa Monica), Sakura Shojo Kai (Palos Verdes), Nipponettes (Long Beach) and Tartanettes (Los Angeles). "The clubs provided a buffer, a bulwark of belonging that took a little of the sting out of being excluded and also enabled Nisei to learn from each other where they would be accepted and where they might not be," Matsumoto said. During the flapper era, the clubs allowed the girls to explore forms of modern femininity sometimes at odds with the expectations of their immigrant mothers and fathers. Clubs such as the Junior Misses, to which Herzig-Yoshinaga belonged along with Toshi Nagamori, the future mother of Judge Lance Ito, also provided opportunities for girls to socialize with boys, a distinct priority for a generation exposed through movies, magazines and music to American visions of romance. Society, motivated by fears of miscegenation that would not abate until the 1960s, often prevented Nisei girls and boys from participating in mixed-gender activities with whites. Meanwhile, their own parents generally frowned on single couples dating. In fact, most Japanese immigrant parents expected their daughters to enter not into a love match but an arranged marriage. But they looked the other way when it came to co-ed group activities among Nisei. As times changed, so did the clubs. During the Depression, the clubs embraced community service, raising funds and donations for the downtrodden in their community. After West Coast Japanese-Americans were uprooted and confined during World War II, such clubs as J.U.G. — Just Us Girls, founded in Manzanar — provided a much-needed source of cheer, planning parties, dances, sporting events, handicraft demonstrations and, after restrictions loosened toward the end of the war, outings. Such clubs as the Crusaders in Jerome, an Arkansas camp, organized letter-writing campaigns to boost the morale of Nisei servicemen in the U.S. military. Even after being released from camps, Japanese-Americans faced prejudice, hostility and mistrust. Again, clubs stepped into the breach, arranging the outings and recreational activities from which society at large excluded Nisei or for which their parents, who were busy rebuilding their lives, had little time. An example is the Atomettes, a West Los Angeles group whose surviving members continue to meet. Club advisers took Atomettes on outings to such staples of a Southern California childhood as Knott's Berry Farm and Catalina. 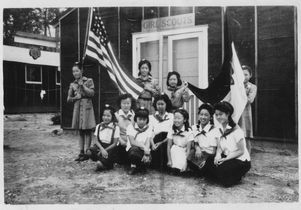 Nisei girls formed scouting troops while incarcerated during World War II in such camps as the Rohwer facility in Arkansas. Ultimately, club activities allowed Nisei to develop a bridge between their immigrant community and mainstream American culture, Matsumoto contends. The organizational and social skills they engendered may also help explain the rapid rate at which the Japanese-American community reestablished itself after wartime incarceration, she argues. 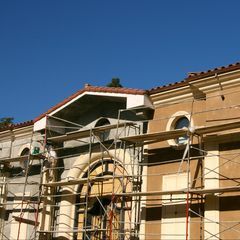 Certainly, several influential Los Angeles natives number among their ranks. In addition to Herzig-Yoshinaga, they include the late sociologist Setsuko Matsunaga Nishi and the civil rights leader and Malcolm X associate Yuri Kochiyama. "The clubs provided leadership training for a generation of urban youth who went on to help rebuild their communities after the war," said Matsumoto. "Some, like Herzig-Yoshinaga, Nishi and Kochiyama, used their skills to challenge injustice wherever they encountered it." A reception for "City Girls: The Nisei Social World in Los Angeles, 1920–1950" will be held from 4 to 6 p.m. on Wednesday, May 7, in the main conference room of Charles E. Young Research Library at UCLA. Aiko Herzig-Yoshinaga, Atomettes co-founder Rose Honda and several Atomettes are expected to attend.